I am from Santiago, Chile. I was born and raised in a capital city. At a young age I was inclined to art. 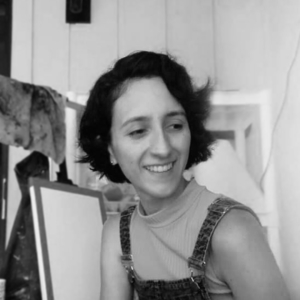 I went to University in Chile, and shortly after moved to United States. I have lived in Lakeland for 5 years, taught painting, designed for Legoland and worked on my art while trying to be involved with the arts around the city. I love learning any technique that allows me to achieve my art. I love sharing my view of the world and my personality through my work. There is something about toys, we create them to entertain, but also we create them to represent us. This duck, a unicorn, something that doesn’t exist, yet, it is a big icon in the present. The idea of giving legs to my ducks is to humanize them, make them relatable, but, also to talk about appearance, what is fake and deceiving. Who is trying to be who? 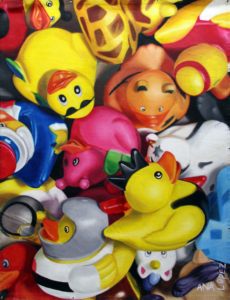 “Ducks in the machine”, is what I like calling the idea that all of these rubber ducks are captured by this machine, constraining them, and, unless we pay, they won’t be liberated. I like to think of it as a comparison to our own lives. 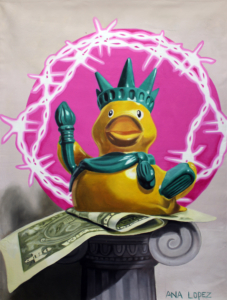 There are four important elements to this painting, the liberty duck, the dollar bill, the neon wire and the ionic column supporting it all. It is a question for society about what we value, what matters to us and where we place our priorities. All I want to convey with this paintings is the impossibility of the size and scale of this object, maybe just having fun and playing with scale. Since I started painting taped thing in canvases, in a much smaller scale, I always wanted to paint a big one, and this is the one. 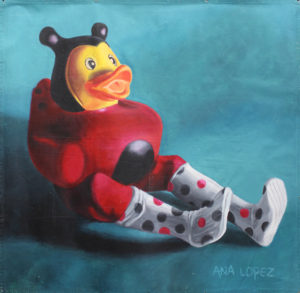 This painting is a strange combination of one of my toys, that in general are the source of my work, and some clay legs that I made myself. 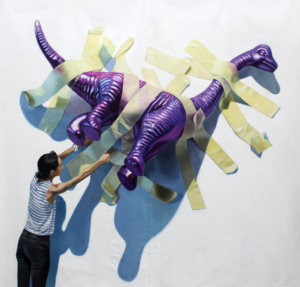 It is an attempt to humanize an absurd object and make it relatable. The duck is simply trying to be something that it isn’t, it represents appearance.